Orca whales are one of the most magnificent animals in the world that have left people in awe for centuries! Not only have we heard the stories and the legends, but also countless confusing labels describing these animals. But what does it all mean?! As we go through this life, we all hear terms thrown around describing these mysterious black and white creatures of the sea: orca whales, killer whales, blackfish or even sea pandas! However, these names are all terms that describe one specific marine mammal species called Orcinus orca. These “whales” are the largest species of dolphin that can be found all over the world! In fact, they are the second most widespread mammal on the planet, second after humans! Because these whales are so widespread, they have diverged into distinct populations called ecotypes. Orca whale ecotypes are unique populations that inhabit different ranges across the world and have subsequently adapted to their environments in a variety of ways. This phenomenon has created at least 10 genetically and culturally unique populations of whales that vary in their preferred prey types, vocalizations and hunting techniques. Here in the San Juan Islands we are incredibly lucky to have two ecotypes that differ in many ways! 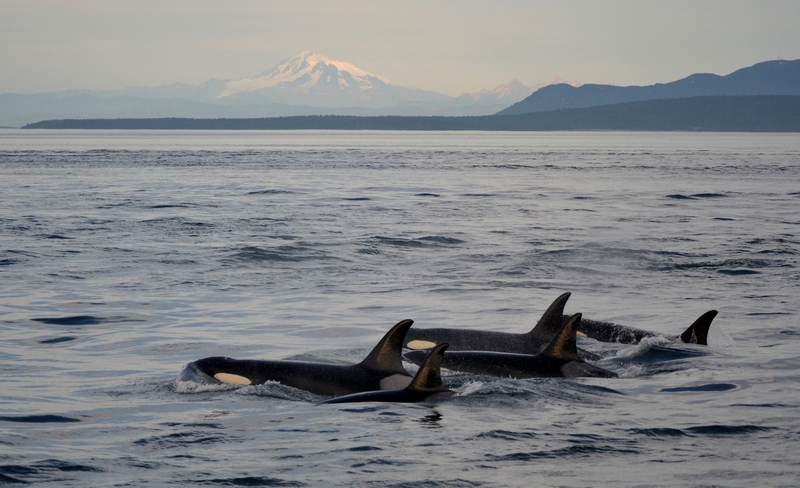 We have the Southern Resident whales and the Bigg’s (also known as transient) orca whales. Although called “residents” and “transients”, these two groups are neither residential or transient! In fact, they inhabit the same exact range extending from southern Alaska to northern California. The range acts like one giant house that they share amongst themselves and travel throughout whenever they feel like it. They are not driven by the need to migrate like many other species of whales. There has been an active attempt to switch the name “transient killer whales” to Bigg’s killer whales in honor of Michael Bigg. Michael Bigg was revolutionary in the foundation of killer whale research and the discovery of the different ecotypes. Physically, the Southern Resident population has dorsal fins that are falcate, meaning they are curved and rounded at the tip. Alternatively, the other ecotype, Bigg’s whales, have a more triangular and sharper tip to their dorsal fin! Their saddle patches (the grey marking behind their dorsal fins) also differ. The Southern Resident whales have saddle patches that often look v-shaped or u-shaped versus the Bigg’s killer whales had a solid grey saddle patch that sits further forward on its body. However, the main difference between these two ecotypes is in what they eat. The Bigg’s (transient) killer whales eat only marine mammals. They are known to hunt harbor seals, harbor porpoises, Dall’s porpoises, Steller sea lions, minke whales and even humpback whales! Because their prey is intelligent, the killer whales have adapted to be as stealthy as possible. They minimize their presence by traveling in small groups between 3 to 7 whales which enables them to listen intently to any possible hunting opportunity and allows sneaky attacks. Alternatively, the Southern Residents eat only fish, primarily Chinook (king) salmon. Because they don’t have to be as stealthy in pursuit of their prey, these fish-eating whales travel in much larger groups. These whales often swim very spread out, covering miles of sea as they hunt salmon while consistently vocalizing across vast distances. Despite their constant search for food, the Southern Resident whales are starving due to the increasing decline in the local salmon populations. As a result, we’ve been seeing their pods depleting in members, becoming sickly and failing to reproduce, resulting in a dangerous low population size. In fact, there are only three Resident pods in the San Juans: J, K and L pods that consist of 23, 18, and 34 members respectively. With only 75 individuals within the Southern Resident population, they have become one of the most endangered species in the world. Having two ecotypes in the San Juan Islands provides a very interesting example of how the same exact species can either thrive or decline depending on just one factor: their food source. We are incredibly lucky to have the two exceptional ecotypes of whales in the San Juan Islands. These spectacular whales bless the lives of hundreds of people every year who are lucky enough to be able to see them up close in their natural habitat. Whether they are called orca whales, killer whales, sea pandas, Bigg’s whales, transient, or resident whales, these unique animals will continue to capture the hearts of people around the world.